This is the barred spiral galaxy NGC 1300, it is 69-million light-years from Earth in the constellation Eridanus; it is about 88,000 light-years across. 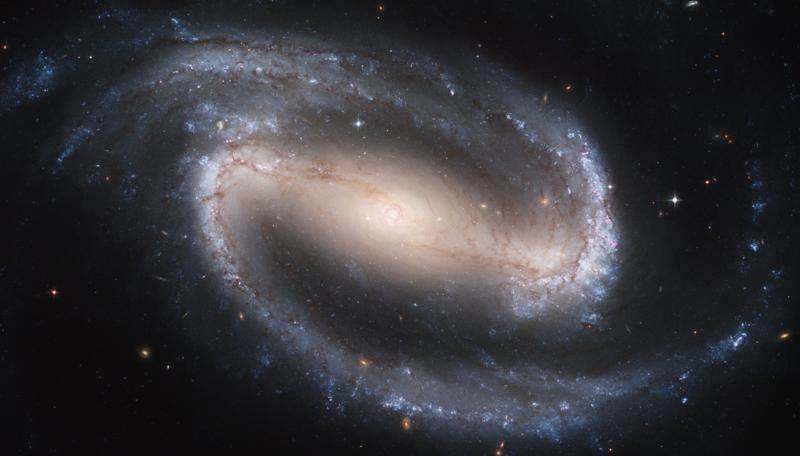 A barred spiral galaxy gets its name because the spiral arms of the galaxy are connected to the ends of a central bar of stars that houses the galactic nucleus. Our most recent surveys suggest the Milky Way is also a barred spiral galaxy. As with many images of astronomical objects, some of the Milky Way’s stars are found in the foreground. They are easily distinguishable because of their cross shape which is an artifact of the telescope being used. Likewise, throughout the image you’ll also find distant background galaxies. Most of them are reddish in color and they are much further away than NGC 13000. The bottom left quadrant of the image contains several such galaxies. Of course, one of the most prominent features of this galaxy are its two impressive spiral arms. These arms contain the galaxy’s youngest and hottest stars, as well as many star clusters (several of these star clusters can be found at near the base of the top spiral, just inside of the center-right edge of the picture). In addition, the dark lines throughout the galaxy are its dust lanes. Here, the dust is dense enough to block background starlight. The bar of stars is the second part of this galaxy, these stars are much older and cooler than the stars in the spiral arms. If you look closely at the galactic nucleus, found right in the center of the bar, you’ll actually see a second spiral. This spiral within a spiral structure is commonly seen in galaxies with large bars. How Does the Sun Appear on Other Planets?